Mission Viejo Montessori understands you have entrusted us with your most precious gift…your baby. Please rest assured, our Mission Viejo Montessori Infant Program Teachers are dedicated to supplying your little ones with the love and attention they need, just as if they are at home with you. The Mission Viejo Montessori Infant Program (Caterpillar) serves children from 6 weeks to 1 year, and our teachers provide a developmentally appropriate, home-like environment for our youngest children to form an attachment, encourage freedom of movement, language development, and increasing independence. In order to enable individualized attention for the infants, we keep our teacher to infant ratio to 1 to 4. Far beyond a babysitter, Mission Viejo Montessori works with parents to create a specialized enrichment plan for each infant to ensure that they receive the best care possible as they learn, play and grow. The Mission Viejo Montessori Infant classroom is equipped with Montessori materials specifically designed for your young child. We believe your child should experience the world around him or her through the five senses and we prepare our classroom with materials that stimulate their senses and support their language and cognitive development. Be it singing songs, reading books, playing music or learning sign language all are an integral part of the curriculum aligned with Mission Viejo Montessori’s “whole-child” approach to teaching. We strive to create an environment that nurtures every aspect of a child’s development — cognitive, physical, social and emotional. 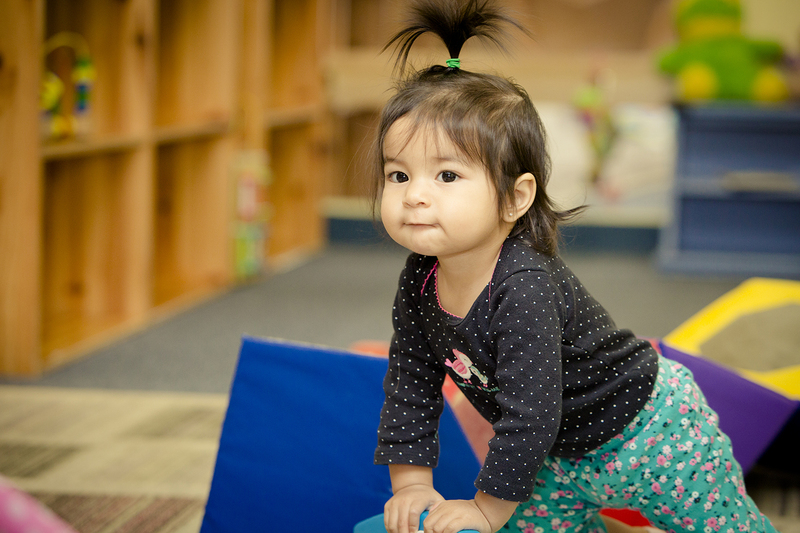 Mission Viejo Montessori believes that in order to develop both fine and gross motor skills, physical activity in infants is an important part of their curriculum. Therefore, we provide your child with developmentally appropriate movement opportunities and maintain a safe environment with exploration both in and outside the classroom. Our spacious classroom provides older infants space to practice crawling and walking while securing a safe place for non-ambulatory infants to explore their own environment. Our outside playground features play equipment, sandbox, and other nature-themed material that provides unique opportunities for gross motor skill development, creativity and problem-solving. Since all infants have different schedules, teachers take your child’s cue and gently respond to their basic needs such as eating and sleeping while encouraging independence. Teachers keep a log of feeding/diapering/nap schedules as well as any other information and milestones for parent’s information. Mission Viejo Montessori believes that the communication between parents and teachers is greatly valued, and our teachers are always available to discuss any concerns or questions you may have.